YOU can tell a lot about a person by whom they choose to marry. As the nominees selected at this week’s Republican National Convention and next week’s Democratic one take the stage along with their family members, they will display not only stark policy differences, but also two competing views of marriage, kin and the role of women in society. What we saw from Republicans: Men who want their wives at home while they celebrate the professional successes of their daughters. The Republican Party has long praised traditional family values and intrinsic differences between men and women, while Democrats emphasize egalitarianism and expanding opportunities for women and girls. Few candidates in recent history have embodied those dissimilarities in such sharp relief as Hillary Clinton and Donald J. Trump. On Monday night, Mr. Trump’s wife, Melania, spoke about her husband and their family values. The speech was, like the woman herself, fairly unobjectionable on its face, with platitudes about family and country, patriotism and hard work. Like much of the Trump image, though, the shiny veneer hid shoddy construction: The very same parts of the speech that lauded integrity, hard work and honesty were lifted almost word for word from Michelle Obama’s 2008 convention speech. It seems not even purported Trump family values are authentic. To borrow from Mr. Trump: sad. One traditional value Mr. Trump does hew to: wanting an old-fashioned wife but a modern, professional daughter. 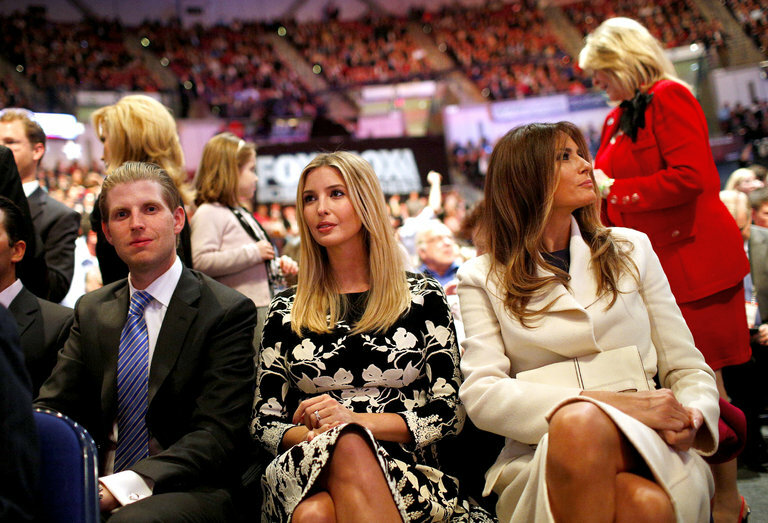 On Thursday, convention-goers heard from the elder Trump daughter, Ivanka, a successful businesswoman whose feminism-tinged speech about the gender wage gap and affordable child care sounded less like any policy positions ever pushed by Mr. Trump and more like her book-in-progress, “Women Who Work.” They also witnessed how the Trump family embodies a very old sexist hypocrisy: Men who want one thing for their wives and another for their children. It can feel unfair to criticize political spouses, who are often dragged into the spotlight only because of whom they married. Mr. Trump, though, is running for office, making his treatment of women — personal and political — as relevant as his treatment of his employees or business partners. The distinctions between the Clinton marriage and the Trumps’ reflect an uncomfortable evolution also happening in homes across the United States. In the past half-century, American women have undergone a transformation in roles, andmarried couples now look a lot more like the Clintons — or Ivanka Trump and her husband, Jared Kushner — than whatever traditional view of women and home life that Mr. Trump holds: Most women work outside the home full time, and men increasingly marry women who are their educational and professional equals. But the public remains deeply ambivalent about these shifts. Today, 40 percent of women are their family’s primary breadwinners, and nearly 80 percent of Americans agree that women should not return to traditional roles in society. A third still say it’s best for small children if Mom doesn’t work at all. The Republican Party has particularly struggled to accept this new model, and still pushes back on women’s progress by opposing policies that would help women work and plan their families: things like federally funded child care,paid parental leave and access to birth control. Ivanka Trump’s speech on Thursday was closer to a laundry list of the very policies Democrats have promoted and Republicans have tried to block. And like Mr. Trump praising his daughter’s business acumen, men want different things in their wives than in their daughters. Changing gender roles look less threatening when it’s their children who benefit. According to a survey published by Maria Shriver’sShriver Report, American men listed “intelligence” as the top quality they valued in both a wife and a daughter, but then the responses split: More men said they wanted their wives to be attractive and sweet than said the same about their female children. For daughters, men ranked being independent, strong and principled as more important qualities than those same characteristics in wives. Two-thirds of men want an independent daughter, but only one in three wants an independent wife. 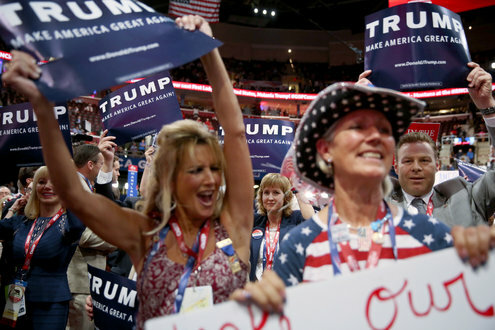 Fourteen percent of men said they wanted a wife who was a homemaker; just 5 percent said the same about their daughters.Donald Trump’s daughter Ivanka has been playing an active role in his campaign, while his wife, Melania, has preferred to take a back seat. The Times’s Jennifer Steinhauer explains how Ivanka Trump is taking a lead. This dynamic seems to play out in the Trump family: Mr. Trump’s wife is professionally attractive, anecdotally nice and by her own telling fairly traditional, while his elder daughter is a strong, independent and well-educated businesswoman who was mentored by her father and rose to prominence inside his companies. Ivanka has been more publicly involved in the campaign than her stepmother, serving as something of a surrogate spouse to Mr. Trump by defending his treatment of women andemphasizing his good character. And it was Ivanka, not Melania Trump, who not only introduced Mr. Trump as the Republican Party nominee on Thursday night, but highlighted what he would do in office to help women. This female empowerment narrative — of the daughter, not the wife — is one Americans are more ready to accept. A man who says he’s never changed a diaper and is on his third marriage to a former model may appeal to a resentful male minority, but will look unfamiliar and unappealing in much of the country. A successful child, though — that’s relatable and desirable. When men have daughters, their attitudes shift and they begin to adhere less stringently to traditional gender roles; no similar effect happens to mothers of girls. Fathers of daughters are also more likely to support reproductive rights than men who don’t have girls. Men have often given their female offspring more opportunities than their female partners, perhaps seeing their children as extensions of themselves. Even today, many men find themselves newly appalled at sexism after having a girl, a reaction apparently not stoked by being born of a woman, married to a woman or simply seeing women as human. In our reluctantly feminist America, one question this election poses is whether we’ve evolved enough to value women as individuals instead of assessing them relationally, as an attractive wife supporting her husband or as a high-achieving daughter reflecting a flattering light back on her parents. It’s a question Mr. Trump has addressed in his personal life. His answer isn’t very pretty.